However, you before the audit occurs, you must also ensure you identify your scope of certification. It is important to note that the supplier and certification body must agree on the level of certification the supplier wants before the audit begins. Once this is decided, it cannot be changed. To learn more about the scope, refer to the SQF Code. 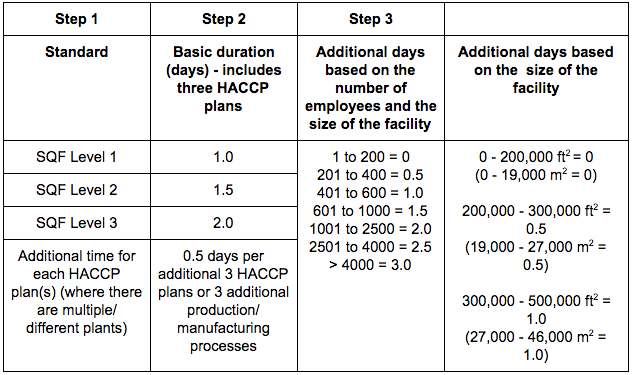 The below tables outline how long each stage of the audit is expected to take. Major—Major non-conformities should be corrected within 14 days of your facility audit. Critical—A critical non-conformity will result in a failed facility audit. If the auditor finds room for improvement in your food plant that doesn’t qualify as a non-conformance, these areas are recognized by the auditor as not being an industry best practice. These do not require a corrective action response like the non-conformities. Instead, these notes are given to communicate what ways your plant could improved re: following SQF guidelines. Facility audit scores are determined on a scale of 0-100. Minor, major and critical non-conformities all result in point loss. If you receive an “F – Fails to comply,” you will not receive a certificate and must re-apply for another facility audit. Your plant will remain SQF-certified for 75 days after the anniversary of your audit date. To maintain certification, you must receive at least a “C – Complies” at re-certification audits within the required time frame. If you had non-conformities that were reported on an audit, it is up to you to correct these discrepancies within the window provided by your certification body. 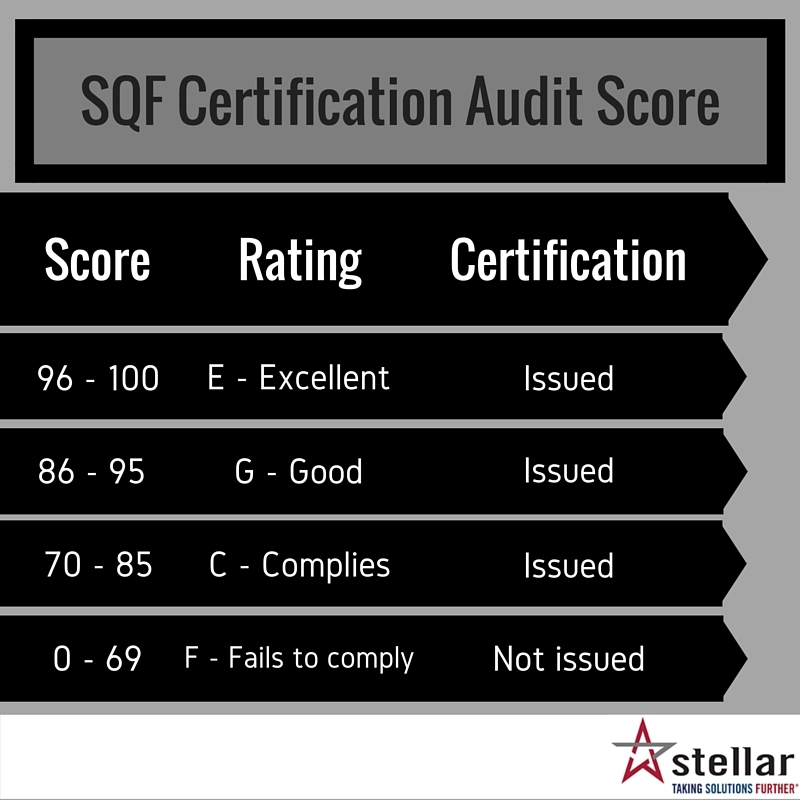 If you’d like to learn more about the SQF certification audit process, visit the SQFI website or email me at jbove@stellar.net.